A few people walked out of the room. Of the two youths at the front, both looked as if they were carved out of ice and jade, both wore the same snow-white robes, and both had sword tassels which swayed in the breeze, alongside ribbons on their clothes. The only differences were their ambiences and facial expressions. Wei WuXian could tell at once that, if the one with a stern face was Lan WangJi, the gentle one must be the other Jade of the Lan Sect—ZeWu-Jun, Lan XiChen. Nie HuaiSang also wanted to join in, but he had been reminded of his older brother as he met Lan XiChen. Cringing silently, he didn’t dare to have fun, “I’ll pass and go back so that I can review…” With this act, he hoped that Lan XiChen would put in some good words for him to his brother. Wei WuXian and Jiang Cheng went back to their rooms to prepare. Although Lan WangJi didn’t express his opinion, the phrase “I beg to differ” was written all over his face. A silence fell upon them, as if the air was frozen solid. He wanted to defend himself further, but Wei WuXian and Jiang Cheng already grabbed their swords and headed over, so Lan WangJi had to shut his mouth. The group mounted their swords and set off. The place where the water ghouls haunted was named Caiyi Town, about ten kilometers away from the Cloud Recesses. Caiyi Town was connected with paths of water. It was either a net of rivers densely covering the town, or dwellings packed on either sides of the web-like water paths. The houses had white walls and grey roofs, and the rivers were filled with boats of baskets and people. On the banks, they sold flowers, fruits, bamboo crafts, pastries, tea, and silk. Having only stayed for a short time, the group boarded ten-or-so narrow boats, and rowed toward where the water ghouls gathered. Gradually, the number of houses on the banks decreased, and the river path became quieter as well. Wei WuXian and Jiang Cheng each had a boat, competing who could row faster while listening to events in the area that concerned water ghouls. This water path led to a large lake ahead of them, named Biling Lake. Caiyi Town hadn’t been haunted by water ghouls ever since tens of years ago, yet, for the past few months, people had started to fall into this path and Biling Lake. Boats which carried goods also sunk without any reasons. A few days ago, Lan XiChen casted a few nets over this area. He expected to catch one or two water ghouls, but got about a dozen instead. He cleaned the corpses and carried them to a nearby part of the town, only to find that some corpses were not familiar to any of the local people, and remained unclaimed. Yesterday, he set up the net formation again, and caught quite a few again. However, Wei WuXian kicked the side of the boat which he was standing on, and tipped it over using the bamboo paddle. On the bottom of the boat, there were three water ghouls with swelling faces and ashen skin, tightly clinging onto the wooden boards! Thick, long hair formed veils of black satin, surging and swelling around the boats. Amid them, pairs of ghastly hands gripped onto the sides. Lan WangJi backhandedly drew his sword, Bichen, and severed ten-or-so wrists on the left of the boat, leaving only palms with fingers digging deep into the wood. As he was about to cut the ones on the right, a red light flashed past, and Wei WuXian’s sword was already back in its sheath. Wei WuXian let out a sigh, “Think outside the box, won’t you? I wasn’t asking you to call it whatever you wanted to, but the name of my sword just happens to be ‘Suibian’. 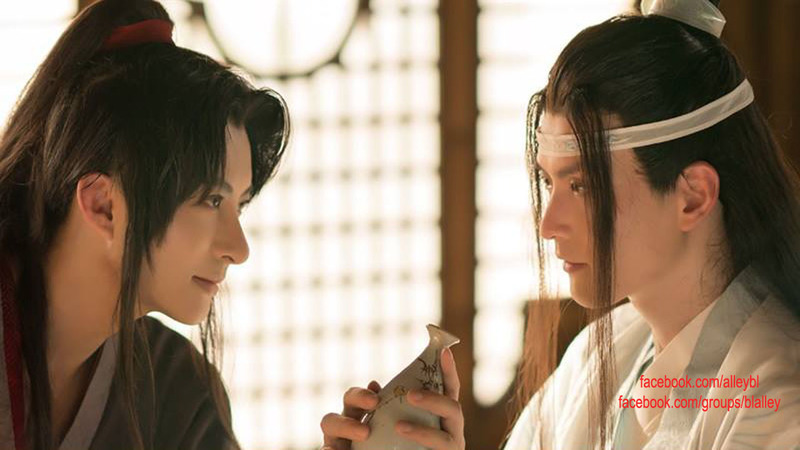 Here, look.” As he spoke, he passed the sword over for Lan WangJi to see the characters on the sword. Surrounded by lines and patterns, two ancient characters were carved onto the sheath. It was “Suibian”, indeed. For a few moments, Lan WangJi was at a loss for words. Cultivators have the ability to use their swords to hover in the air as a way to travel. It usually uses spiritual energy and is one of the things a cultivator learns in their earlier stages. They just stand on the sword (as if it’s a skateboard). The word suibian in Chinese means “whatever”.